The crazy winter weather where I live on Long Island has not been very conducive to the sorts of slightly frenetic spurts of creativity that I love. The whole world seems encased in ice and snow and one gets the feeling of being both trapped and sluggish. So I couldn't have asked for better timing for the arrival of the new(ish) book called "The Art of Tinkering" the other day. The Art of Tinkering is billed as a way to "meet 150+ makers at the intersection of art, science & technology." It's a colorful book bursting with photos, ideas, and even simple DIY projects. The cover of the book (shown above) is printed with conductive ink --- so you can even experiment with and hack your copy! 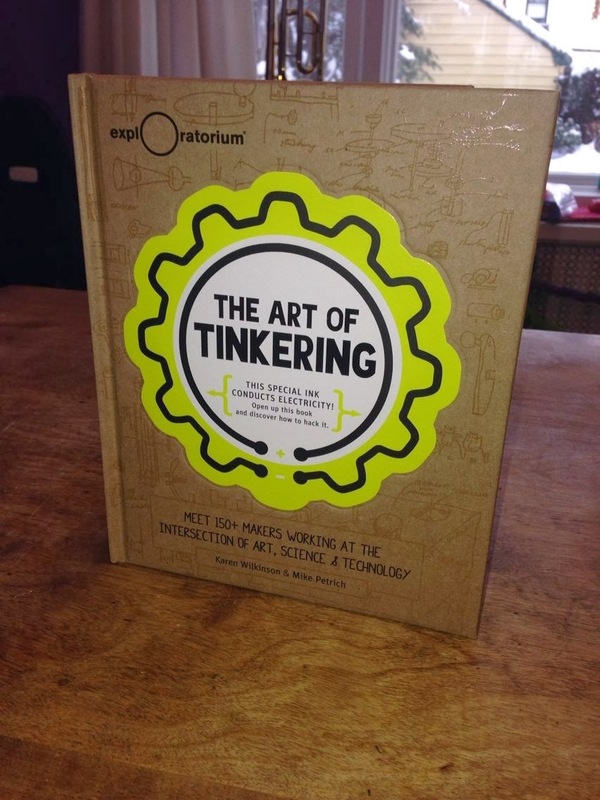 Karen Wilkinson and Mike Petrich, the folks who spearheaded The Tinkering Studio at The Exploratorium, have put together a fantastic book that captures the spirit of The Tinkering Studio while also giving you a sense of the inspirations and working styles of the makers featured inside. Here's one of my favorite suggestions from inside the book: Put yourself in messy, noisy & sometimes dangerous situations! But enough talk --- grab a copy of The Art of Tinkering and warm up your own creative impulses!